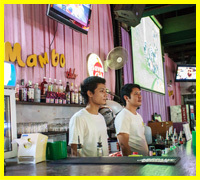 Mambo is the newest addition to Soi Green Mango club street. 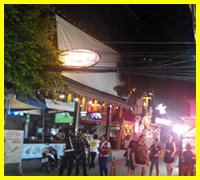 Located right on Chaweng Beach Road, Mambo is the gateway to nightlife on Samui, and your first stop on a great night out, with an international menu, bistro coffee, and big screens for all day entertainment. Like the dance it's named after, Mambo is all about rhythm, fun and energy, and is designed to crank up your mood to the max before launching you into the center of Green Mango. The music is Latin inspired, and freshly mixed by Mambo's resident DJ. 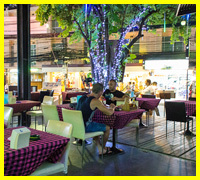 Mambo is made up of two floors -the lower on Beach Road level and the ideal spot from which to people watch in the late afternoon and early evening. The upper floor provides further seating and an additional viewing point. 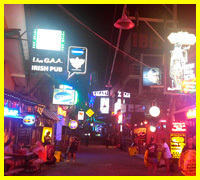 Late in the night, Mambo offers a cool chill-out break close to Green Mango and Sweet Soul, so you can recharge your batteries and head back to the dance clubs with fresh Mambo energy.